As many of you probably already know (or if you don't you do now) we raise our own chickens and so we have fresh eggs daily. If you've never had a fresh egg then it may be a bit hard to understand what I mean when I say there's nothing that compares to fresh eggs. They look better from the moment they are cracked open to the time they are cooked up and served. The color is just so much brighter and more natural. The taste is the same way - I don't really know how to even describe it other than...fresh. Knowing this is actually what peeked my curiosity to check out other foods that are raised in a similar fashion. Recently I was able to check out a few products from Circle B Ranch. They raise their hogs outside being pasture fed vs. in a controlled environment being fed grain and other additives. And I have to say after trying their meatballs and sausages I have to agree there is definitely a difference in the appearance as well as the quality compared to your standard store bought pork products. The meatballs I received were very generously portioned, so much so that I actually cut them into fourths when adding them to my spaghetti and meatballs dinner. These are the kind of meatballs that you use to make the perfect meatball sub with. Being fully cooked they are great for those nights you forget to pull out your meat for dinner too. I'm one that's guilty of that so having something like this as a staple in my freezer would be great. I also received a package of their Hot Italian Sausages, not my cup of tea because I'm not into spicy foods but my husband devoured them in no time. He said he loved the flavor and that they were so juicy when he bit into them. I took his word for it because there was no way I was going to try them and burn my mouth..I'm what one might call a spice weenie when it comes to hot stuff. But I still buy it because I know he enjoys it so much. Circle B Ranch also carries many other pork products as well as a nice line of sauces to accompany them. I love that on the individual sauce pages they even give you some ideas of how to use them just in case you aren't familiar with them. This is great for people like me that aren't always adventurous and need a little direction when it comes to using new sauces. I've actually been eye-balling a few of their sauces that sound like they would be really good in the crock-pot poured over a nice piece of pork loin. Circle B Ranch is a family-owned and operated farm specializing in naturally, sustainably and humanely raised pork with no added hormones or unnecessary antibiotics. Circle B Ranch raises their hogs the “old-fashioned” way, outside 100% on pasture where the hogs can run and exercise their instincts, the way nature intended. That is what makes Circle B Ranch meat redder and more succulent. If you’re looking for the best pork available on the market, look no further than Circle B Ranch. I have never had fresh eggs but I can only imagine how much better they would taste. It sounds like Circle B Ranch has some great products. I love spicy so I would love to try the Hot Italian Sausages. I love spicy foods so I think I would enjoy this! Looks delicious! These look delicious! There is nothing like fresh meats and eggs! I love spicy foods and natural foods. Yum! This looks so, so delicious! The Hot Italian sausage looks great! Hubby would devour it! First off, I have to say, your eggs sound like they'd be delicious. I'm also not a fan of spicy foods, but I'd love to try their Sweet Italian Sausage. I've never heard of Circle B Ranch, but it sure looks good! I've actually never heard of this brand but I love the different meat varieties! My boyfriend and I are always making sausage and stuff like this so I will definitely check them out! That speghetti and meatballs looks delicious! but I don't think we have one over here , I will have to check. I have never tried Circle B Ranch products and usually shy away from frozen premade meatballs. 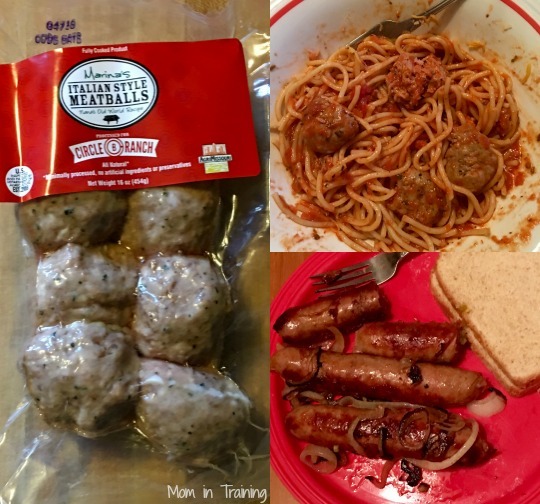 I may have to give these a try though, they sound like they would be so much better than the mystery meat frozen meatballs I have tried in the past. It would be comforting to know that the animals were raised in humane conditions,I think that's important. I had never heard of Circle B Ranch before, but now I can't wait to try their food, especially the bacon! These look tasty! It's nice to know where the food comes from when you purchase products from Circle B Ranch. I don't eat meat, but my mom would love this! I have not had fresh and delicious egg since I was a child. My sister lived on a farm and everything she cooked was fresh.